PlayGround Blog: PlayGround Festival Master Classes! 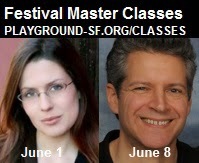 PlayGround has added two Playwriting Master Classes to this year's PlayGround Festival lineup, each led by a Bay Area master teacher: "The Playwright's Process" with Lauren Gunderson (6/1) and "Career Planning for Playwrights" with Anthony Clarvoe (6/8). Both classes will take place 7pm-9pm at Thick House, 1695 18th Street (between Carolina and Arkansas Streets), San Francisco. Registration is $20 per class, $30 for the 2-class package and is automatically included with the purchase of an All-Festival Pass. For more information, visit htttp://playground-sf.org/classes. How do you take your shiny new idea and commit it to the page? How you get to the end? How do you collaborate with directors and designers and actors? Lauren explores how to get it done. How to organize and order your activities, both tactical and strategic, to set and work toward your artistic goals. Anthony Clarvoe has received American Theatre Critics, Will Glickman, Bay Area Theatre Critics, LA Drama Critics, Elliot Norton, and Edgerton New American Play awards; fellowships from the Guggenheim, Irvine, Jerome, and McKnight Foundations, NEA, TCG/Pew Charitable Trusts, and Kennedy Center; commissions from South Coast Rep, Mark Taper Forum, and Playwrights Horizons; and the Berrilla Kerr Award for his contributions to American theater. Productions include Pick Up Ax (South Coast Rep, San Jose Rep), The Living (Denver Center), Let’s Play Two (South Coast Rep), Ambition Facing West (Trinity Rep, Theatreworks), Ctrl+Alt+Delete (San Jose Rep, George St. Playhouse), The Brothers Karamazov (Cincinnati Playhouse, Circle X), Show and Tell (Rep Theatre of St. Louis), and Our Practical Heaven (Aurora Theatre). His plays are published by Broadway Play Publishing, Inc. The Art of Sacrifice was published last year by Random House in the anthology Plays for Two. Anthony is a regular instructor at Playground, Stagebridge,and the Playwrights Foundation. Free Tickets to the PlayGround Festival!